Does GO's UV-m Ink contain HAPs or VOCs? No. UV-m does not use solvent for viscosity reduction so we do not have any HAPs or VOCs. Does UV-m Ink meet US Consumer Product Safety Commission requirements for children's products? Yes. GO's UV-m Ink meets the requirements of the Consumer Product Safety Improvement Act (CPSIA) for lead and phthalates for children's products. This is an important standard and In our market segment we are not aware of any other company having this certification. What is the expectation for outdoor UV stability for UV-m? We have a very specific statement about the outdoor UV stability of UV-m Ink, but generally one can say the ink will last for two years outdoors without seeing any degradation. This is of course dependent upon the conditions and the imaged substrate. How well does GO UV-m ink adhere to uncoated substrates? With few exceptions the adherence to uncoated substrates is very strong and generally no primer of any type is needed. Additionally with the GO F-24's two UV lamps, UV-m cures much faster and offers much better adhesion. 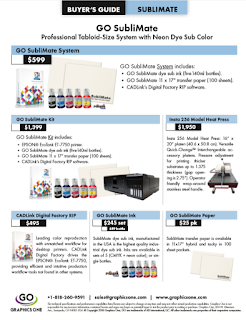 Our suggestion is prior to purchasing a printer is to forward any substrates to Graphics One for testing. Does GO offer a primer? Yes. GO will offer primer specifically for specialty non-porous substrates such as glass or specialty metals, but generally no primer is needed. 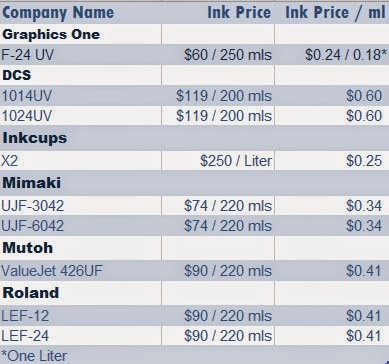 How do the GO's UV-m costs compare to competitive UV ink prices?